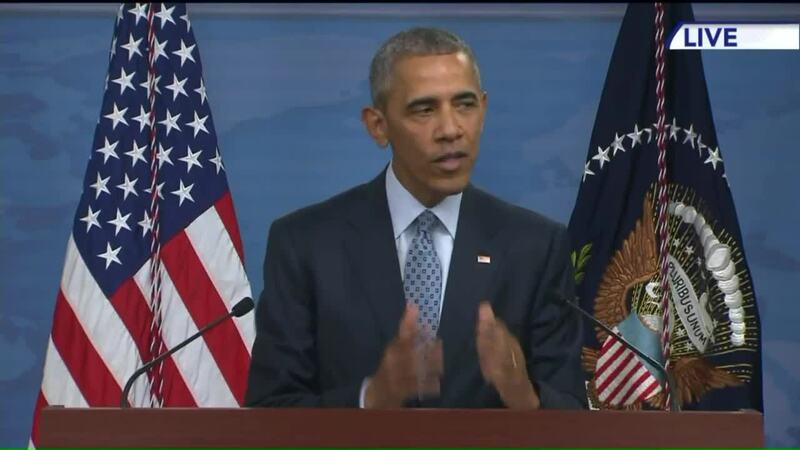 President Barack Obama held a press conference on Thursday at the Pentagon briefing room. The president met with national security officials at the Pentagon Thursday to discuss the the United States' fight against the Islamic State group. The American air campaign against IS targets in Libya will be high on the agenda. The U.S. has been focusing on targets in and around the Libyan city of Sirte. The air strikes began this week, targeting IS strong holds and tanks. A soldier hugs the President as he greeted U.S. troops at Bagram Air Field in Afghanistan. Obama claps as he passes by 'The President's Own' US Marine Band on the White House grounds. Obama greets US troops as he holds a Veterans Day event at the US Army Garrison at Yongsan military base in Seoul November 11, 2010. Obama shakes the prosthetic hand of Medal of Honor award recipient Army Sergeant 1st Class Leroy Petry. Army SFC Petry lost his right hand tossing away a grenade to save his fellow soldiers during combat in Afghanistan. President Barack Obama speaks to soldiers of the 10th Mountain Division during a visit to Fort Drum in New York, June 23, 2011. Obama greets US military service members and their families at Elmendorf Air Force Base in Alaska. Obama poses for a photo with troops at Camp Victory in Baghdad. Obama greets US service members at the Pentagon. Obama signs a patient's military banner while visiting wounded warriors at Walter Reed. Obama fist-bumps a US soldier at Camp Victory in Baghdad. President Obama visits service members in Afghanistan. President Barack Obama poses for a photograph with Oregon National Guardsman, from left, Alek Skarlatos Air Force Airman 1st Class Spencer Stone, and Anthony Sadler, in the Oval Office of the White House in Washington, Thursday, Sept. 17, 2015. The three helped prevent a terror attack on a French train in August 2015. Obama hugs a soldier while visiting troops at Camp Victory in Baghdad. President Obama meets with members of military families. President Barack Obama jokes with Commander Wendy Halsey and Command Master Chief Al Marcucci following his arrival at Camp David, Md., for the G8 Summit, May 18, 2012. The President applauds Medal of Honor honorees, from left, Staff Sergeant Melvin Morris, Sergeant First Class Jose Rodela, and Specialist Four Santiago J. Erevia, during the Medal of Honor ceremony in the East Room of the White House. The President awarded these three Army veterans plus 21 others posthumously the Medal of Honor for conspicuous gallantry. President Barack Obama, Vice President Joe Biden and Veterans Affairs Secretary Eric K. Shinseki encourage participants during the Wounded Warrior Project's Soldier Ride on the South Lawn of the White House, April 17, 2014. President Barack Obama visits soldiers at the USO at Landstuhl Regional Medical Center in Germany on June 5, 2009. President Barack Obama and First Lady Michelle Obama talk with Corporal William "Kyle" Carpenter, U.S. Marine Corps (Ret.) in the Blue Room following a Medal of Honor ceremony in the East Room of the White House, June 19, 2014. President Barack Obama watches as members of the National Naval Medical Center's Marine Wounded Warrior basketball team play on the White House Basketball Court, Oct. 8, 2009. Obama greets military personnel after taking part in a ceremony welcoming the Wounded Warrior Project's Soldier Ride at the White House. Vice President Joe Biden met with Defense Secretary Ash Carter, CIA Director John Brennan and other Cabinet secretaries on Thursday. Obama also to touched on the recent Zika virus transmissions in Florida. The president took questions after his speech, and commented on recent events involving Republican presidential nominee Donald Trump.